This evening the Duchess elected to wear an American designer, Tory Burch. 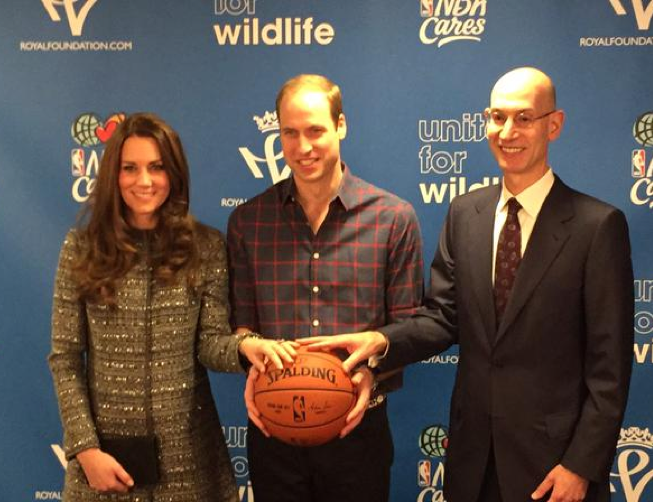 Kate and William started their evening at a reception celebrating the work of the Tusk Trust and United for Wildlife. 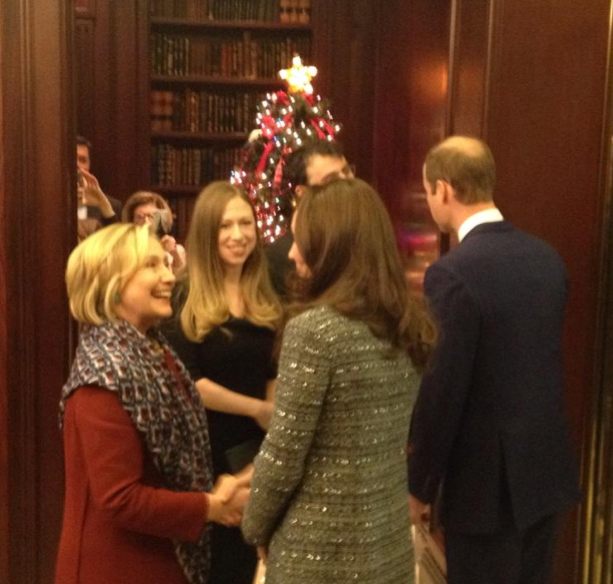 Kate and William arriving at the British Consul General’s residence, meeting Hillary and Chelsea Clinton. 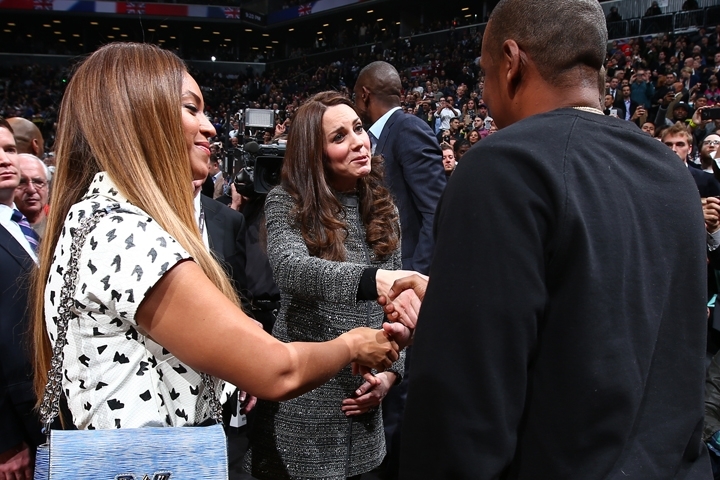 The royals then headed to the Barclays Center for tonight’s NBA game between the Cleveland Cavaliers and the Brooklyn Nets. 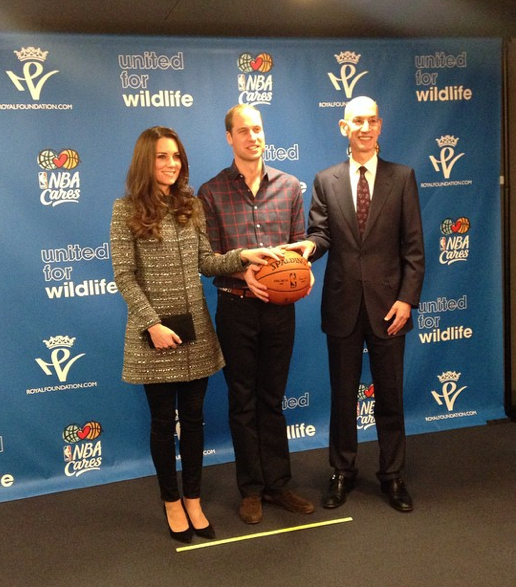 The evening’s business purpose was to announce a partnership between the Royal Foundation, United for Wildlife and the NBA. If you’ve ever wondered how everyone knows where to stand, note the yellow line marking places at the bottom of Simon Perry’s photo. Here you have a good look at the coat from the front. 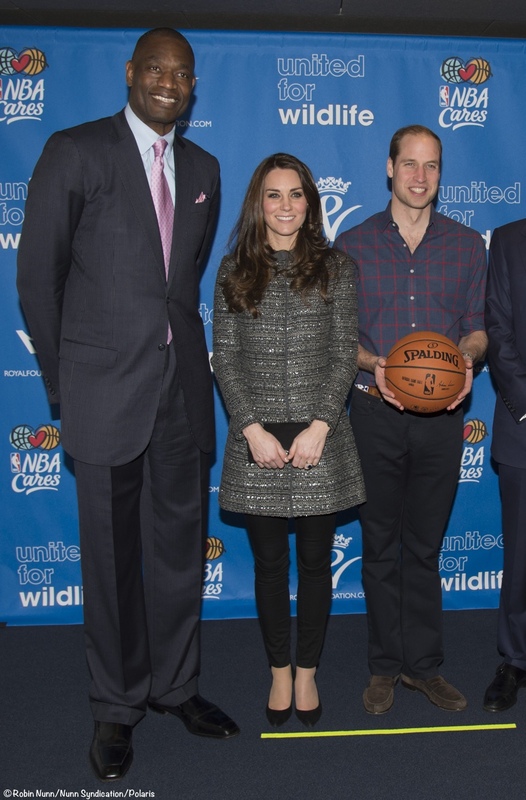 Kate is standing next to former player Dikembe Mutombo, who will be a United for Wildlife Ambassador. 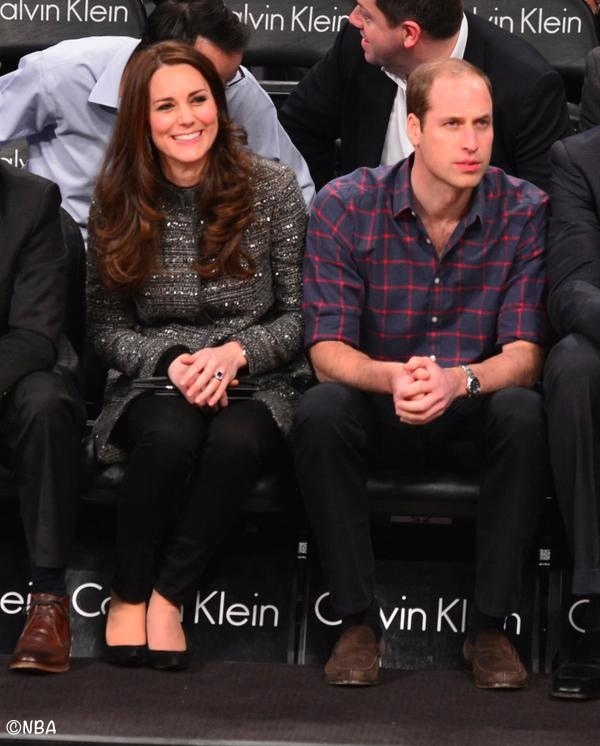 After spending the first half of the game having dinner, Kate and William moved courtside, accompanied by huge cheers from the audience. 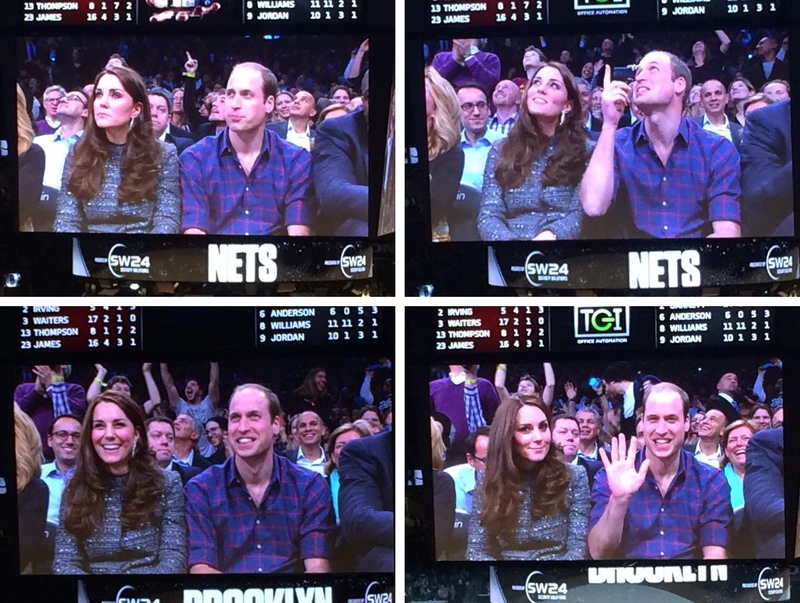 The British Consulate posted these images of Kate and William. The pair obviously enjoyed themselves. 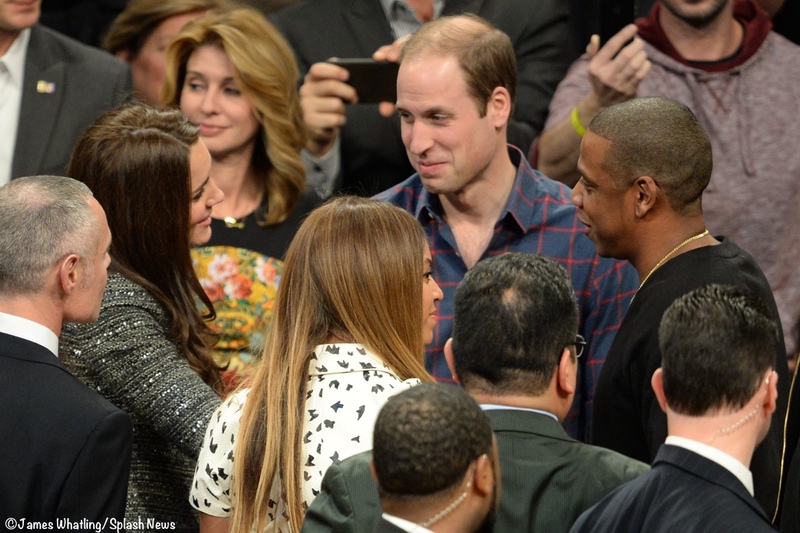 During a break between quarters William and Kate met Beyonce and Jay-Z as Rule Britannia played. The NBA posted photos of tonight’s events on its website. We move now to specifics on what Kate wore this evening. 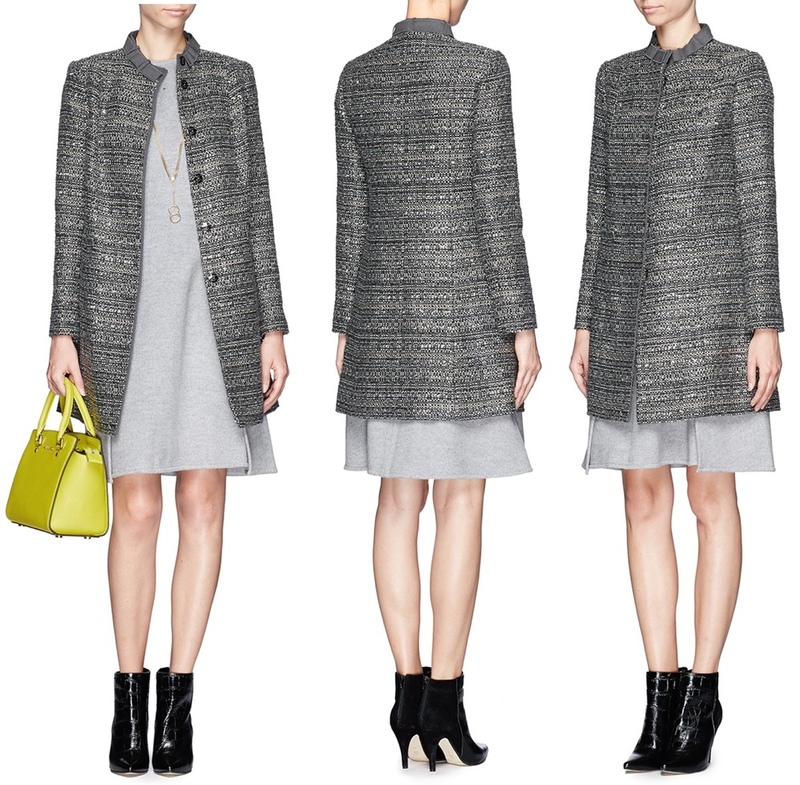 As noted, she was in a Tory Burch piece, the Bettina coat. Below we show it at Lane Crawford, where it remains available in just one or two sizes. The coat originally retailed at $595, most recently selling on the US site at $357, where it is now sold out. The Bettina is available in very limited sizes at the Tory Burch UK website, although it is not discounted on the UK site, selling at £515, roughly $800. 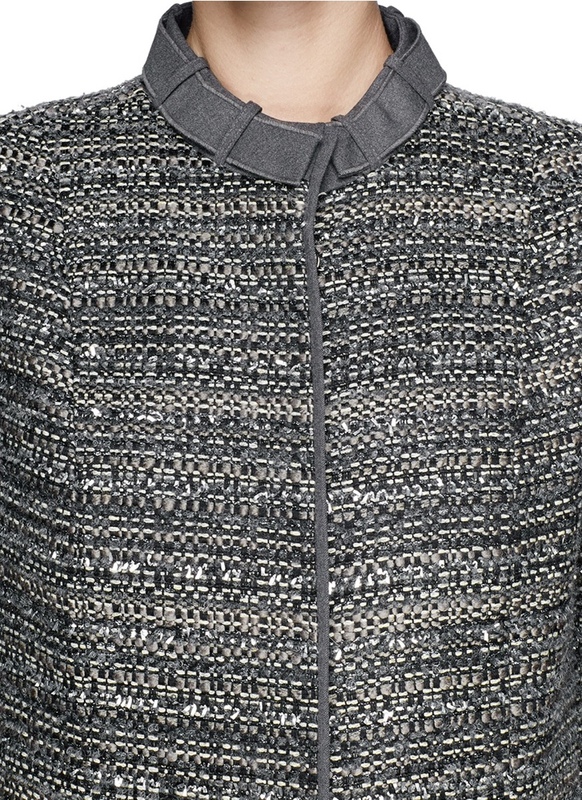 One of the more distinctive elements of the coat is its “belted” collar. The fabric is described as “a cotton blend, woven with bouclé, slubbed and metallic yarns — updates the look of classic tweed with a horizontal-stripe effect and a hint of shine.” This is the second piece Kate has worn on the trip that is constructed of heavily textured fabric. It works well on her frame. You get a sense of the metallic fibers in this photo. This same fabric is used in other Tory Burch pieces. Below we show the Deandra dress at Bloomies, as well as the Jane jacket, both at Bloomies in limited sizing. 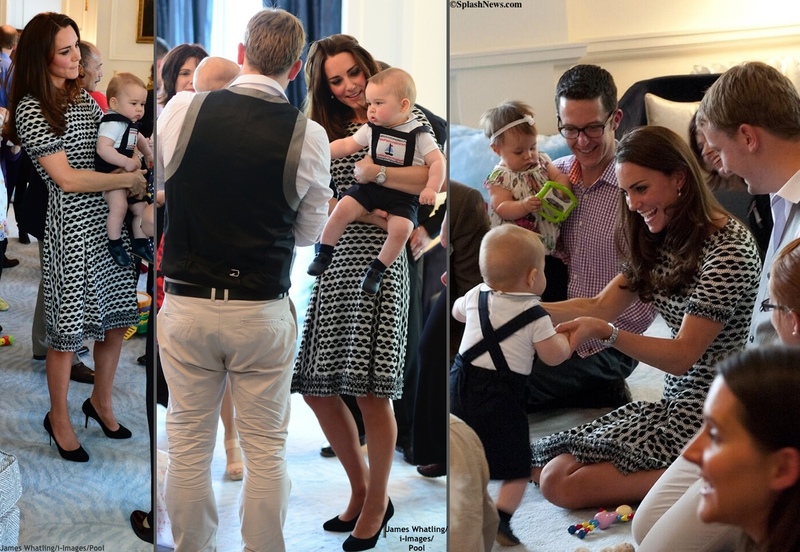 Many readers will recall that Kate wore Tory Burch for Prince George’s playdate during this spring’s tour. I wouldn’t be surprised to see Tory Burch become a staple in her wardrobe. The Duchess carried her black Mulberry clutch again and wore her Stuart Weitzman ‘Power’ pumps. 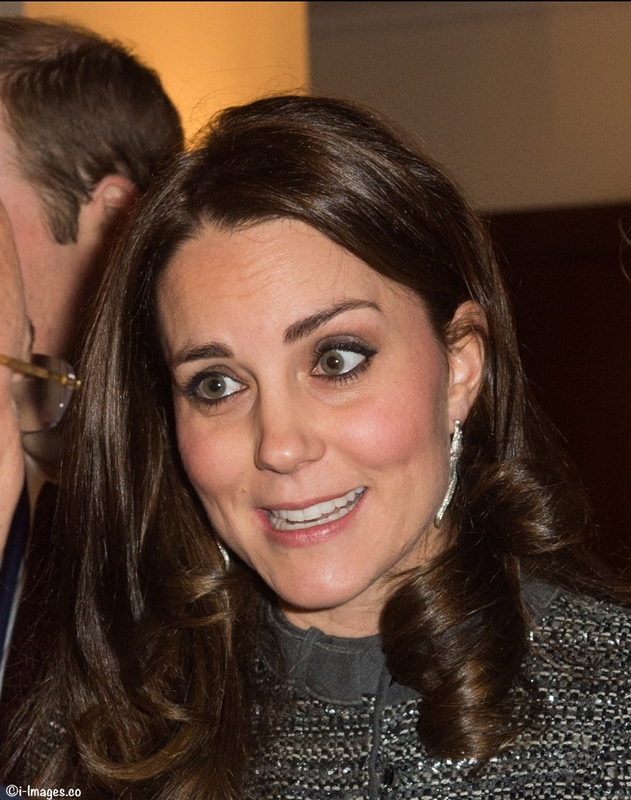 Kate was in a pair of black skinny jeans that we have not identified, as well as a black knit top or sweater that haven’t been IDed. Nor have we been able to get any traction in terms of identifying the new earrings. I have hunted and hunted for photos better showing them but have come up empty-handed. 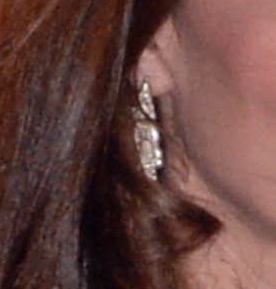 Melissa J on the WKW Facebook page wondered if perhaps Kate is wearing a pair of Patrick Mavros Crocodile Stud earrings. I think she may be on to something. 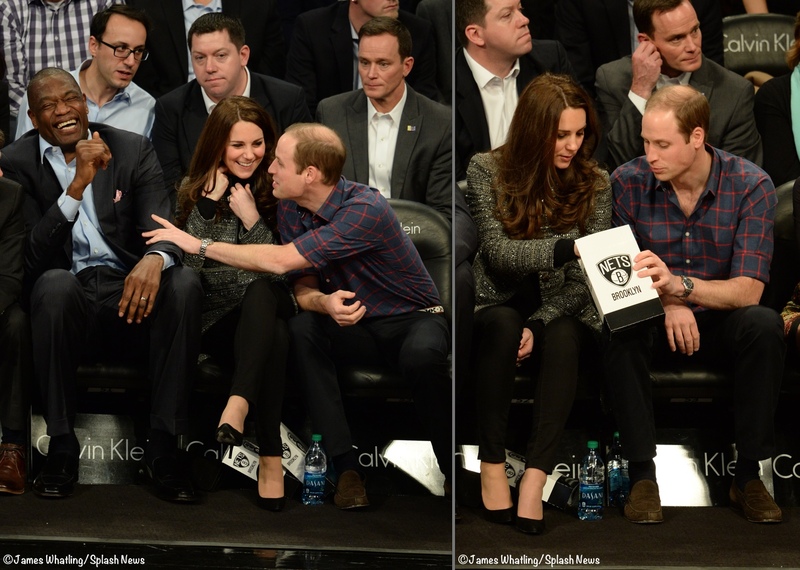 The photo below left offers a different perspective than that shown above, and Kate has worn the brand before. Perhaps most important, thematically the earrings would sync perfectly with the evening’s mission and message. The jeweler is based in Zimbabwe and he is a strong supporter of wildlife conservation. As always the post will be updated if/when we have better info/photos of the yet-to-be-identified items. 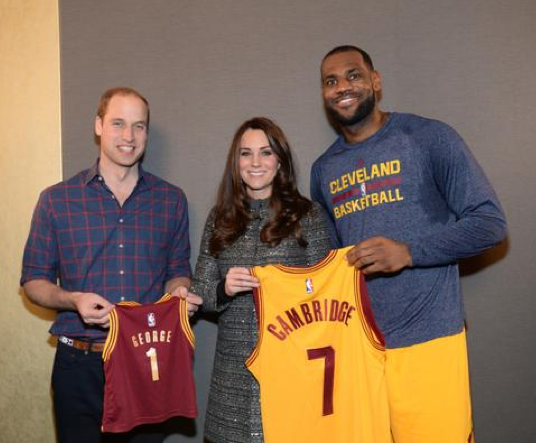 We’ll leave you with this shot of Lebron James presenting the Duke and Duchess with an NBA ‘Cambridge’ jersey, as well as one for Prince George.